Mineral Foundation Powder create a sheer coverage, or a matte finish that will radiate your natural good looks and elegance. 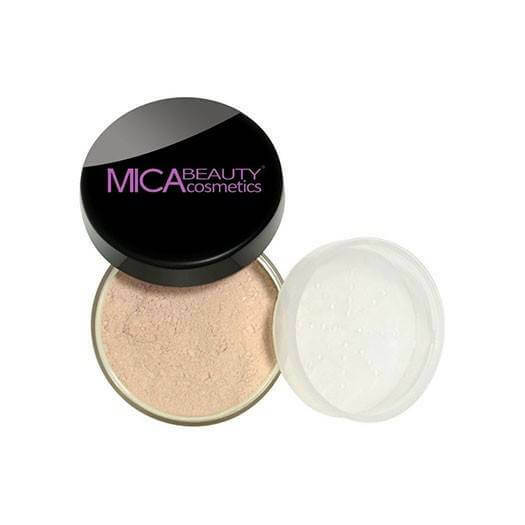 Get flawless glowing skin with our 100% all-natural Mineral Foundation Powder! 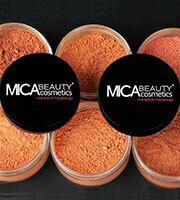 Our all-natural, oil-free powder will enhance your natural beauty, while calming your skin. Mica Beauty's Foundation contains 100% all-natural ingredients and is free from harmful chemicals, dyes, and talc. As our Mineral Foundation Powder is all-natural, it is irritant free and ideal for sensitive skin! It is safe to use over acne, rosacea, and redness. It will let your skin breathe without clogging your pores. Our formula will give you full coverage all day and night. With Mica Beauty a little bit goes a long way. You only need to apply a small amount to create a glowing radiance! You can apply our Mineral Foundation Powder wet or dry to create a sheer coverage, or a matte finish that will radiate your natural good looks and elegance. We provide a variety of shades for light and dark skin tones. For a flawless application, start with our Perfecting Makeup Primer before applying our Mineral Foundation Powder using our Kabuki Brush. Finish with your favourite setting spray for a look that will take you from a day at work to a night with friends. Mica. May contain (+/-): Titanium Dioxide (CI 77891), Iron Oxides (CI 77491, CI 77499, CI77492), Chromium Oxide Green (CI 77288), Ultramarine Blue (CI 77007), Bismuth Oxychloride (CI 77163). Fast delivery, matches my skin tone well and last for the long haul! Great product! Received mine after 2 days of ordering it! This is my 3rd purchase and I still love it! The shade guide helped me in choosing the correct shade for me! And I got my product in 2 days! The foundation have a sheer matte finish, and it still looks good with my dry skin, with no formation of lines, as long as I moisturised and prime my skin beforehand. I received my Mineral Foundation Powder in 3 days! The colour matches my skin perfectly and I would definitely recommend it to my friends.